BEAUTY SPOT: The wildlife pond is at the heart of Holme For Garden’s conservation policy. As well as being a source of irrigation, it is also stocked up with native plants and is a home for newts, frogs, toads, dragonflies and damselflies. 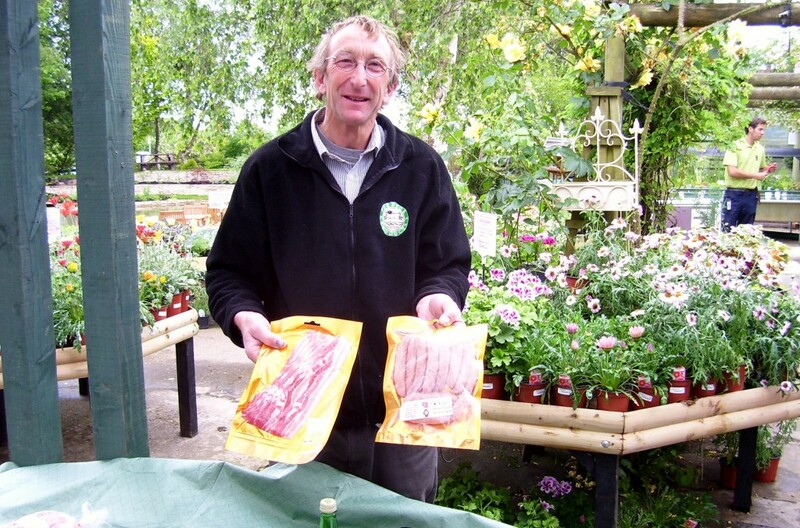 MEAT FEAST: Philip Samways shows some of his quality pork products on sale from his farm in Langton Matravers. PURBECK PRIDE: Simon Goldsack serves customers at the strawberry fair at Holme End Farm. He says Holme For Gardens is focused on its local customer base and that Purbeck comes first. LOCAL PRODUCE: Tracey Collins of Ajar Of, was tempting visitors at the strawberry fair with her home-made james, chutneys and pickles. Tracey is a regular face at open days and country shows across Dorset. WINDY conditions didn’t prevent many families and couples coming out to pick their own strawberries on the Purbeck Peninsula. 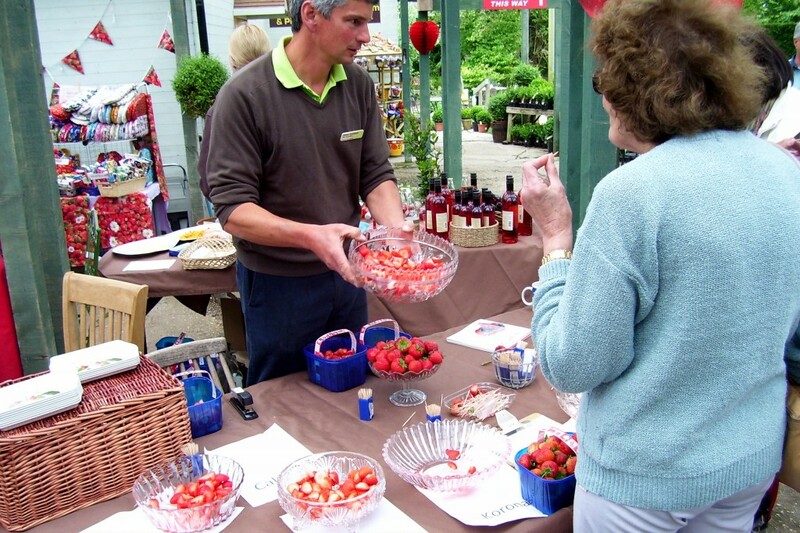 The strawberry fair at Holme For Gardens, West Holme Farm, Wareham, took place on Saturday 22 June with live music, plenty of stalls and opportunities to look out for any shrubs and potting plants. There have been previous open days at the farm including the cider and sausage festival in August last year and there was also a successful open day last Christmas too. The fruit farm and nursery grows 14 different types of strawberry and eight types were on display for visitors to try out a free taster session. As well as the fruit and the plants, there were stands of bacon, sausages and burgers provided by Phil Samways of Langton Matravers and Mr Hole of Wareham and some exotic fruit wines on another stall. 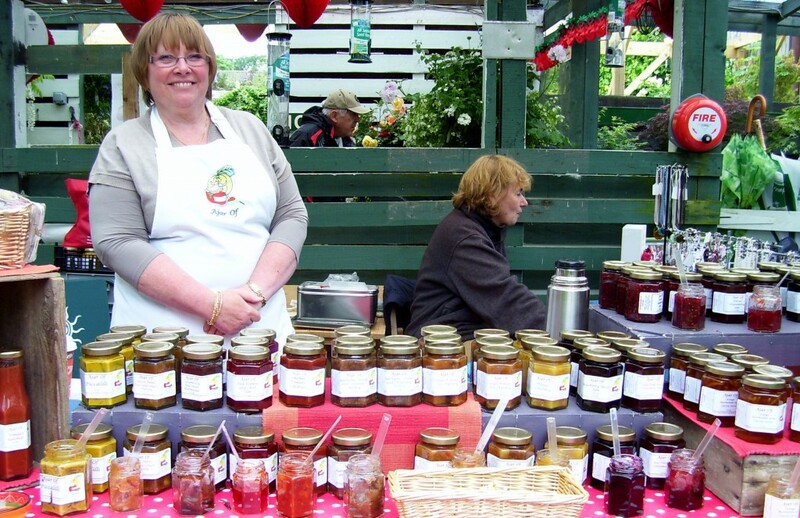 Tracey Collins of Ajar Of was selling her home-made james, chutneys and pickles. Despite the crop of strawberries flowering late, the nursery’s seven colonies of bees had done their pollinating well and the crop has come out favourably. As well as the strawberries, the gooseberries will be ready to pick at the end of June and shortly after that, so will the blackcurrants. Both these crops are laden with fruit and picking will be easy. 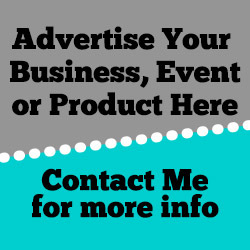 Simon said: “We have some 4,000 clients on our books. We support local producers and small businesses alike and our ‘food mileage’ is kept to a minimum. We employ 30 people and this helps the local economy. We try to keep things local as much as we can. Purbeck comes first, then Dorset, the South West and then the rest. Rob’s wife Liz is in charge of the farm shop. It provides the basic essentials from free range eggs and freshly baked bread to more luxurious items such as local beers and flavoured oils. Holme For Gardens has a number of climbing and rambling roses, ideal for walls and pergolas. Summer geraniums were presented neatly ready for customers to put into their gardens. An old, quaint red BT telephone box has provided a wonderful distraction when looking around the shrubs and hedging plants. A topiary hedge of a horse and jockey and a stunning dovecote designed by Tony Garrett caught the eye. 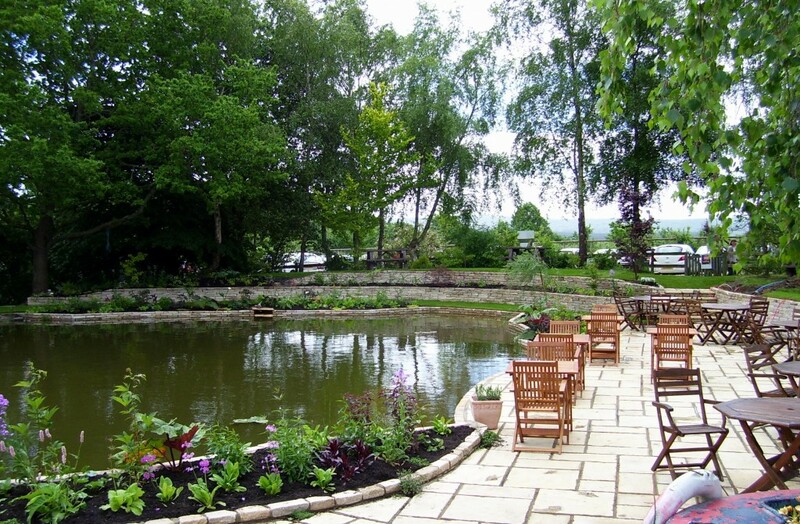 Also extremely prominent is the wildlife pond at the back of the café. The pond is a source of irrigation for the fruit farm and nursery but is a wildlife haven for frogs, toads, newts, dragonflies and damselflies and frequent visitors such as bats, herons and swallows.